Originally built as a temple to the seven gods of the seven planets, the Pantheon was later consecrated as a Christian church in the 7th century. Its construction is accredited Marcus Agrippa, in the year 27 B.C. during the Roman Empire, the Pantheon was later destroyed by a fire in 80 A.D. and rebuilt around 125 A.D. during the reign of Hadrian and in 609 the Byzantine emperor Phocas donated the Pantheon to Pope Boniface IV who consecrated it as The Church of Mary and the Martyrs. It was for this reason, being property of the church, that it was saved from a greater amount of plundering and abandonment, a common occurrence during the medieval period but sadly, many years earlier in 663, when Emperor Constantine II visited Rome, he had the church stripped of all ornaments including priceless bronze tiles and the exquisite roof, and brought it all to Constantinople. During the course of the centuries, however, marble from the exteriors and sculptures adorning the pediment above Agrippa's inscription on the façade were also removed. During the papacy of Pore Urban VIII (1623-1644) the broze ceiling of the portico was melted down and used to make cannons for Castel Sant'Angelo, giving what was left to artists who contributed to the art done for the Vatican. The bronze doors, although restored several times, have remarkably survived. 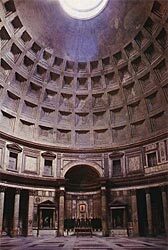 The cylinder shaped Pantheon is topped with a Dome and oculus consisting of five rows of twenty-eight square coffers of diminishing size. The natural sunlight though the oculus strikes amazing color to its interiors. The dome spans over 43 meters making it second to Brunelleschi's dome found in Florence on the cathedral. Visits to the Pantheon are free and is open from Monday through Saturday from 8:30 a.m. to 7:30 p.m, on Sundays from. 9 a.m. to 6 p.m. and from 9 a.m. to 1 p.m. on holidays falling on weekdays except for Christmas Day, New Year's Day and May 1, when it is closed.